In the last video, you saw how we got our grapes from vineyard to winery. Well now that they're at the winery - Matt, our assistant winemaker from California, explains what happens next! We've shown you where and how we pick our grapes. In this fun video, we take a look at how we get our grapes from vineyard to winery! 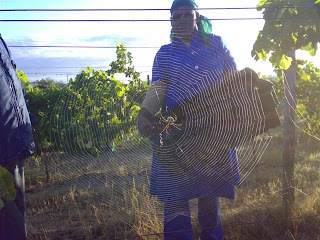 One of the drawbacks of organic Viticulture. Thank to all your nominations - we are pleased to announce that the Warwick Blog has made it into the finalists stage of the SA Blog Awards 2008!! With that in mind, we have one last favour to ask you: Can you please click on the icon below and vote, vote, vote for us!!! Thanks everyone, have a great day and crack open a great bottle of wine tonight! With the Warwick Trilogy being awarded 93 points by Wine Spectator - we felt it was only right that we give her a little tribute!